Okay guys, I know that I have been MIA for some time now but that is because I have been working on a project which I am very happy to present to you. As you all know that Flickr.com (pronounced “flicker”) is an image hosting and video hosting website, and web services suite that is a popular website for users to share and embed personal photographs, and effectively an online community. With a total of 87 million registered members and more than 3.5 million new images uploaded daily, flickr.com is one of the biggest source of beautiful images. I am a regular user of flickr.com and there are some users whose albums I like and would like to download but the sheer number of images in those users albums make it next to impossible to download. 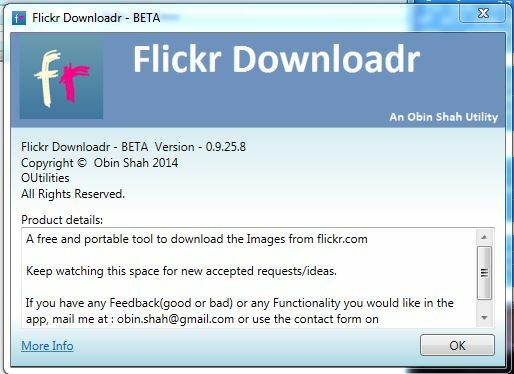 Flickr.com does provide a way to download images from a set but you can only download one image at a time and if the set in question has more than 200 – 300 images then you can imagine the “fun” you will have downloading each image one at a time. Plagued with this problem, i decided to do what is do best and approach this problem programatically and came up with Flickr downloadr (deja vu!!!). Before i explain what the downloader is about, i would like you to be aware that the downloader is currently in BETA and i’m releasing this to users to understand user requirements and to make any changes as applicable. The app is nearly fully functional and free of bugs(as much as i could test) but it might be possible that some have escaped me.